We’ve had the bus for nearly two years, albeit the blog is only up to month ten. And we still haven’t given it a name. I don’t know how big Eddie Stobart’s fleet is but but all his trucks have names – girls’ names. Campervans need names don’t they? But you can’t just call it anything – there needs to be an emotive reason behind the name. Ours had a name when we picked it up – Bruce, on account of the fact it‘s an Aussie import and named by the previous owner – not our choice – more of an inherited name. My work mates call it Bruce because that was its name when I picked it up. I’d be happy with Bruce – after the mighty Bruce Springsteen, but then people could be confused and think we’re Bruce Forsyth fans. And well we might be, but you can’t go round having people think that you are. On the other hand Sarah is not one of Springsteen’s biggest fans, so the name Bruce didn’t last as long as his shortest record. Sapabus is the blog name. This name being derived from the fact we have a burning desire to drive the bus to Sapa in Vietnam, a place we visited on holiday a few years ago and would love to go back to. No, that’s not true. A 13,000 mile round trip at 20 miles per gallon would cost a fair few quid – £3000 to £4000 I reckon, not to mention the time needed (approx. 25 days of hard driving each way) – it would be a daft idea. We have been to Sapa, but I made the other bit up. Sapa comes from the first two initials of our names, Sarah and Paul…. Sapa. Whilst this is the blog name it hasn’t really stuck as a name for the bus. What about Custard Mustard – because of its colour as featured in earlier blogs? I sometimes call it the Custard Mustard – Mustard Custard (an interchangeable name) but only in passing rather than in name. It’s my favourite ‘in passing’ name. The Van – it gets called this a lot. Because it’s a van. A campervan. But then I guess all campervans, even those with names, are just called ‘vans’ at some point. A bit impersonal really. The Bus – I think it probably gets called a bus the most, although we do have some debates about whether it was a bus before it was a van. Who knows but, pre-conversion, a lot of Splitties and bay windows were people carriers – or small buses. Maybe the name Buster might emerge one day. Or Bussy? I dunno. I really dun-no. Clint Eastwood’s character in the spaghetti westerns had no name and he was as cool as mustard custard. I now proclaim our bus’s name to be…. Clint. “No you won’t” says Sarah. Fair enough. TomTom – our Bongo mate (I’m writing this whilst on our first 2011 outing with TomTom & Teblis) has just reminded me that a popular custom is to name your bus/van/bongo after the place where you first breakdown. That means, following this rule, that our bus does indeed have a name. I’m going to have to go look it up on a map, but it does have a name and has had since July 2010 ! Of course this blog is two months away from that episode, so you’ll just have to wait to find out what it is. In fact, I’m going to wait until I write that episode before I look up it’. How excited are you ! 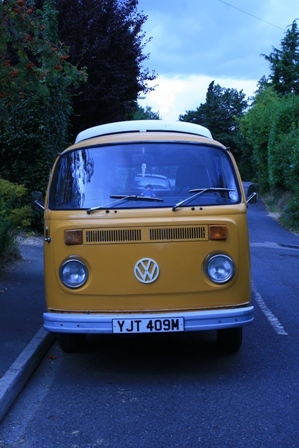 This entry was posted in The SapaBus Blog and tagged Clint Eastwood, Sapa, VW Bay, VW Campervan, VW names.